I've just read Philippa Gregory's The Kingmaker's Daughter, the fourth in her series on The Wars of the Roses from the women's points of view. I enjoyed this one the most because it's more sympathetic to Richard of Gloucester, later Richard the Third. It's told from the point of view of Anne Neville, the second daughter of Warwick the Kingmaker, briefly wife to Henry VI's son Edward and then wife to Richard of Gloucester. While Gregory is sympathetic to Richard she doesn't attempt to whitewash him but presents him as a man of his time and she shows his good points. The most disturbing issue that she brings up in her series is his alleged seduction of his niece Elizabeth. Philippa Gregory has posted her thoughts on the discovery of Richard the Third's remains, in which she writes "but those of us who cannot help but admire Richard," clearly showing her sympathies. This makes her achievement in writing her three other books in the series from the point of view of Richard's enemies rather remarkable to me. I thought that she as an author loathed Richard. I'm looking forward to seeing, if my magic website works, the BBC's The White Queen that is based on Gregory's books. 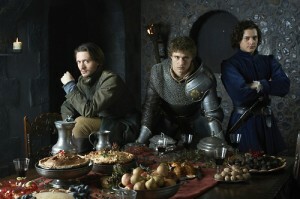 This photo shows the three York brothers: David Oakes as George of Clarence, Max Irons as Edward IV and Aneurin Barnard as Richard of Gloucester. I like David Oakes but he unfortunately seems to be getting typecast as a psychotic character. I'd like to see this too, any idea when it's coming out? I read somewhere that it'll be shown in spring in the UK, so April maybe? My mom's a big Phillipa Gregory fan, so I'll have to let her know that you really enjoyed The Kingmaker's Daughter. I'm not sure if she's read that one yet. Actually, I wouldn't mind reading The War of the Roses series myself. I think I've read most of Gregory's books set in the Tudor period. That BBC series looks like it could be really good. I hope it lives up to expectations. I haven't read any other Philippa Gregory books besides this series because I'm uninterested in the Tudor period, but I think her writing is of really high quality.